In the 22nd Bond movie Quantum of Solace, Daniel Craig as James Bond wears Tom Ford 108 sunglasses. 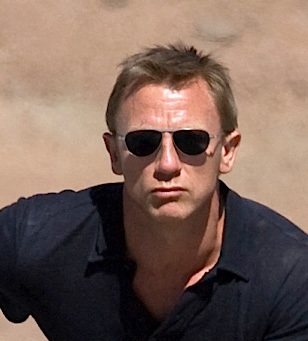 Since GoldenEye, Bond has usually worn Persol sunglasses, but in Quantum of Solace he chooses Tom Ford. These Tom Ford glasses, made of a semi matte rhodium frame with black temple tips and smoke blue lenses (19V) are handmade in Italy by Marcolin. The glasses come in a special case with James Bond logo. There is also a brown version of these glasses, but make sure to get the blue version if you want the same one as in the movie. Unfortunately these sunglasses are now not available anymore. The only chance to find these online is on eBay.com, which offers still a wide, but expensive selection.